PARIS ? The Iranian government announced Feb. 3 that it hadsuccessfully launched live animals into space. The feat was recorded by a camera mounted on the vehiclethat provided a live video stream of the rocket?s ascent. The Feb. 2 launch of the Kavoshgan 3 rocket came a yearafter Iran?slaunch of its 27-kilogram Omid store-and-forward telecommunicationssatellite and was accompanied by a Feb. 3 unveiling of three new Iranian-builtsatellite designs and a new rocket engine. 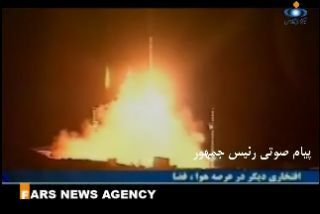 Iran?s government-controlled Press TV on Feb. 3 broadcastvideos of the launch as seen from the ground and from the rocket-mountedcamera. Iranian officials said the rocket carried a rat, called Helmiz 1, as wellas two turtles and a worm. The expected duration of the capsule experiment was notdisclosed. Earlier versions of the Kavoshgan rocket were launched inFebruary and November 2008. At a Feb. 3 ceremony attended by Iranian President MahmoudAhmadinejad, the Iranian Aerospace Organization unveiled three newtelecommunications satellites, called Toulou, Mesbah 2 and Navid. Also unveiledat the ceremony was the Simorgh engine, which according to the Press TV reportis designed to place a 100-kilogram satellite into a 500-kilometer orbit. Iran?s Omidtelecommunications satellite was launched in February 2009 into an orbitthat the U.S. Space Surveillance Network tracking stations said had an apogeeof 382 kilometers and a perigee of 242 kilometers, with an orbital inclinationof 55 degrees relative to the equator. Reaza Taghipour Anvari, the head of the Iranian AerospaceOrganization, said in May that the Omid satellite had already reentered theEarth?s atmosphere. U.S. Space Surveillance Network data confirmed that thetwo-stage Safir-2 rocket placed an object into an orbit with an apogee of 382kilometers and a perigee of 242 kilometers, inclined at 55 degrees relative tothe equator.